We are hearing about the next flagship killer from the OnePlus, after the OnePlus One, the OnePlus Two. 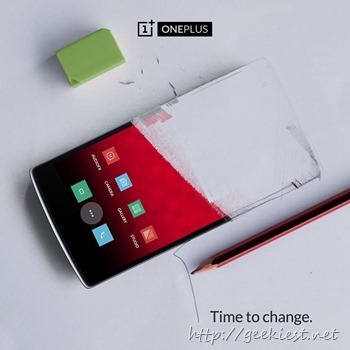 OnePlus teased the release of OnePlus two on the social media. Recently a benchmark is spotted on the website Geekbench, which says OnePlus Two is having a Qualcomm octa core Snapdragon 810 processor, with 3 GB of RAM and Android 5.1 Lollipop. The Price of the phone is expected as 2499 Yuan, which will be around INR 25,000 and USD 400. All the things wrote above are just assumptions, we will get the exact picture about the specifications and price on June 1, 2015. There will be a cheaper variant of the Oneplus Two (not sure about the release date) as hinted by the CEO of OnePlus. We’re always looking for ways to shake up the tech industry. And we think it’s time for a change. Find out more June 1. OnePlus Two will be released on June 1, 2015.